Class I HLAs generally present peptides of 8–10 aa in length, although it is unclear whether peptide length preferences are affected by HLA polymorphism. In this study, we investigated the CD8+ T cell response to the BZLF1 Ag of EBV, which includes overlapping sequences of different size that nevertheless conform to the binding motif of the large and abundant HLA-B*44 supertype. Whereas HLA-B*18:01+ individuals responded strongly and exclusively to the octamer peptide 173SELEIKRY180, HLA-B*44:03+ individuals responded to the atypically large dodecamer peptide 169EECDSELEIKRY180, which encompasses the octamer peptide. Moreover, the octamer peptide bound more stably to HLA-B*18:01 than did the dodecamer peptide, whereas, conversely, HLA-B*44:03 bound only the longer peptide. Furthermore, crystal structures of these viral peptide–HLA complexes showed that the Ag-binding cleft of HLA-B*18:01 was more ideally suited to bind shorter peptides, whereas HLA-B*44:03 exhibited characteristics that favored the presentation of longer peptides. Mass spectrometric identification of > 1000 naturally presented ligands revealed that HLA-B*18:01 was more biased toward presenting shorter peptides than was HLA-B*44:03. Collectively, these data highlight a mechanism through which polymorphism within an HLA class I supertype can diversify determinant selection and immune responses by varying peptide length preferences. In humans, MHC molecules, or HLAs, play a central role in Ag presentation and are characterized by a high level of polymorphism concentrated within the Ag-binding cleft. The six pockets (A–F) of the HLA class I Ag-binding cleft vary in their depth, electrostatic potential, and hydrophobicity, thereby determining the individual specificity of the peptide–HLA I interaction (1). For most HLA alleles, two of these pockets display a marked preference for one or two amino acids at certain positions within the peptide. In addition, residues at secondary anchor positions can also enhance or inhibit allele-specific binding (2, 3). A degree of degeneracy in HLA–peptide binding has been demonstrated, whereby multiple class I alleles can share common sequence motifs (referred to as supermotifs) owing to homology of amino acids within the major pockets of the peptide-binding cleft, and these groups of alleles are referred to as HLA supertypes. On the basis of these HLA structural similarities and overlapping peptide-binding motifs, nine major HLA supertypes have been proposed (4). The HLA-B*44 supertype, for example, includes the common alleles HLA-B*18:01 and HLA-B*44:03, which share a preference for peptides with Glu at position 2 and Phe or Tyr at the C terminus (5–8). MHC class I–peptide binding also involves a conserved hydrogen bonding network at the peptide N and C termini and MHC H chain residues within pockets A and F, respectively, that is highly conserved between different class I allomorphs. These interactions contribute more binding energy to MHC class I–peptide complexes than do peptide side-chain interactions, and are thought to be the major factor limiting the size of peptides presented by MHC class I molecules to predominantly 8–10 aa in length (9). It is clear, however, that some longer peptides can also bind (10–15). Indeed, several MHC class I–bound peptides that are between 11 and 16 residues in length have been characterized structurally, and in each case the peptide was shown to adopt a bulging conformation whereby the “extra length” between the primary anchor residues protrudes outward from the cleft, thereby maintaining the conserved hydrogen bonding of the H chain with the peptide N and C termini (16–25). Thus, central peptide residues often make no, or limited, contact with the MHC within these complexes and, accordingly, can show a high degree of flexibility (16, 21). These bulged epitopes are considered to represent challenging targets for TCR ligation (26, 27) and are generally recognized by specific TCRs with a capacity to accommodate the atypical bulged peptide conformation (28). The BZLF1 or ZEBRA (Z EBV replication activator) protein of EBV is responsible for the switch from latent to lytic gene expression and is an important target for T cell recognition. In this article, we show that the widely expressed HLA-B*44 supertype molecules, HLA-B*18:01 and HLA-B*44:03, present overlapping epitopes from BZLF1 that share a common C-terminal primary anchor residue but markedly differ in size. An explanation for this observation was provided by analysis of the self-peptide repertoire of these two closely related HLA molecules, revealing distinct peptide length preferences. Furthermore, structural analysis of the viral peptide–HLA complexes provided a molecular basis for this inherent bias for presenting peptides of different length. Collectively, we demonstrate that class I HLA polymorphism can skew peptide length preferences without altering anchor residue preferences, thereby having impact on epitope selection in an antiviral response and highlighting an additional mechanism through which the CD8+ T cell responses to foreign Ags are diversified. PBMCs were isolated from healthy, EBV-seropositive blood donors after giving informed consent and approval was obtained from the Queensland Institute of Medical Research Human Research Ethics Committee (Brisbane, QLD, Australia). EBV-specific CTL cultures were raised from volunteers who were positive for either HLA-B*18:01 or HLA-B*44:03, as determined by HLA sequence analysis, by culturing PBMCs (2 × 106/2-ml well) with autologous lymphoblastoid cell lines (LCLs) (2 × 105/2-ml well). Cultures were supplemented with rIL-2 on day 7 and analyzed on day 10. CTLs were also stained with pHLA multimers by incubation for 30 min at 4°C with an allophycocyanin-labeled HLA-B*18:01–SELEIKRY or a PE-labeled HLA-B*44:03–EECDSELEIKRY tetramer. Cells were washed and analyzed on a FACSCanto flow cytometer with FACSDiva software (Becton Dickinson). CTLs from two donors were tested in duplicate for cytotoxicity in standard 5-h chromium release assays. In brief, CTLs were assayed against 51Cr-labeled autologous PHA blast targets (E:T ratio = 2:1) that were pretreated with various concentrations of synthetic peptide or left untreated. Peptides were synthesized by Mimotopes. Toxicity testing of all peptides was performed before use by adding peptide to 51Cr-labeled PHA blasts in the absence of CTL effectors. A β scintillation counter (TopCount Microplate; PerkinElmer) was used to measure 51Cr levels in assay supernatant samples. The mean spontaneous lysis for target cells in the culture medium was always < 20%, and the variation from the mean specific lysis was < 10%. IFN-γ ELISPOT assays were performed using cytokine capture and detection reagents, according to the manufacturer’s instructions (Mabtech). In brief, anti–IFN-γ Abs were coated on the wells of a 96-well nitrocellulose plate, and duplicate wells were seeded with T cells and peptide at 1 μM. After incubation for 16 h, captured IFN-γ was detected with a biotinylated anti–IFN-γ Ab, followed by development with streptavidin–HRP complex and chromogenic substrate, and spots were counted using an automated plate counter. Soluble constructs of the HLA-B*18:01–octamer and HLA-B*18:01–dodecamer binary complexes were expressed, refolded, and purified as described previously (29). Thermal denaturation of both complexes was monitored by circular dichroism spectroscopy over a temperature range of 20–90°C, using an experimentally determined absorption minimum of 218.5 nm. Data were acquired at two different protein concentrations for each of the complexes and then analyzed in PRISM (v5.0c) to determine their respective melting temperature (Tm) values. The raw data were normalized and transformed before being fitted to a dose–response curve by nonlinear regression. C1R-B*18:01 and C1R-B*44:03 cell pellets (3–5 × 108) were ground in a Retsch Mixer Mill MM 400 under cryogenic conditions; resuspended in 0.5% IGEPAL, 50 mM Tris-HCl (pH 8.0), 150 mM NaCl, and protease inhibitors (Complete Protease Inhibitor Cocktail Tablet; Roche Molecular Biochemicals) at a density of 5 × 107 cells ml−1; and incubated with rotation for 1 h at 4°C (15). Lysates were cleared by ultracentrifugation (180,000 × g) and HLA–peptide complexes sequentially immunoaffinity purified using solid-phase bound anti-Bw4 (Rm7.9.63) and anti-Bw6 (HB152-SRF) Abs. Bound complexes were washed and peptides eluted by acidification with 10% acetic acid, as described (14, 30, 31). The mixture of peptides and MHC protein chains was fractionated on a 4.6-mm internal diameter × 50-mm-long reversed-phase C18 HPLC column (Chromolith SpeedROD; Merck), using an ÄKTAmicro HPLC system (GE Healthcare) running on a mobile phase buffer A of 0.1% trifluoroacetic acid and buffer B of 80% acetonitrile/0.1% trifluoroacetic acid and at a flow rate of 1 ml/min. Peptide-containing reversed-phase HPLC fractions were concentrated using a Labconco CentriVap concentrator. Samples were concentrated down to a volume of 15 μl 0.1% formic acid in water, sonicated in a water bath for 10 min, centrifuged for 10 min at 18,000 × g, and finally transferred to mass spectrometry vials for analysis by an AB SCIEX TripleTOF 5600 mass spectrometer equipped with a NanoSpray III ion source and coupled on-line to an Eksigent nanoLC-Ultra cHiPLC system (15, 30). Samples were loaded onto the microfluidic trap column packed with ChromXP C18-CL 3-μm particles (300 Å nominal pore size; equilibrated in 0.1% formic acid/2% acetonitrile) at 5 μl min−1. An analytical (15 cm × 75 μm ChromXP C18-CL 3-μm particles) microfluidic column was then switched in line, and peptides were separated by linear gradient elution of 0–80% acetonitrile over 90 min (300 nl min−1). Mass spectrometry conditions were set to accumulate up to 30 tandem spectrometry spectra per second. Data were analyzed with ProteinPilot software (AB SCIEX), and peptide identities were determined subject to strict bioinformatic criteria that included the use of a decoy database to calculate the false discovery rate. A false discovery rate cutoff of 5% was applied, and the filtered dataset was further analyzed manually to exclude redundant peptides, known contaminants, and nonspecific peptides (i.e., for C1R-B*18:01 those identified with anti-Bw4, and for C1R-B*44:03 those identified with anti-Bw6). MHC motif analysis was based on the frequency of amino acids occurring at P2 and PΩ. Soluble constructs of the HLA-B*18:01–octamer and HLA-B*44:03–dodecamer binary complexes were expressed, refolded, and purified according to standard protocols, described previously (29). Both complexes were crystallized, using the hanging drop vapor diffusion technique, in 0.1 M citrate (pH 5.6), 0.2 M NH4OAc, and 16–26% polyethylene glycol 4000, by seeding from existing crystals of HLA-B*44. Before flash freezing in liquid nitrogen, crystals were cryoprotected by equilibration in mother liquor supplemented with 10–20% glycerol. Complete datasets for HLA-B*18:01–octamer and HLA-B*44:03–dodecamer complexes were collected from single crystals at 100K, at the Advanced Photon Source in Chicago, IL, and the Australian Synchrotron in Melbourne, Australia, respectively. Both datasets were processed in MOSFILM (32) and SCALA (33). Molecular replacement was carried out in PHASER (34), using protein coordinates of HLA-B*44:03 [PDBid 1SYS (35)] as a search model. Refinement and model building were carried out in PHENIX (36) and COOT (37), respectively. Structure validation was performed using MOLPROBITY (38) and tools in the PHENIX package. A summary of data collection and refinement statistics is provided in Supplemental Tables I and II, respectively. The molecular volume of each Ag-binding cleft (corresponding to the Connolly surface) was calculated using the CASTp server with a 1.4-Å probe radius (39). Electrostatic calculations were carried out using only the H chain and β2-microglobulin coordinates of each structure. Briefly, coordinate preparation (placing and optimization of hydrogen atoms, assuming standard protonation at pH 7.0, followed by assignment of atomic charge and radii parameters using the PARSE forcefield) was accomplished using the PDB2PQR server (v1.8) (40). Electrostatic calculations were subsequently carried out using the APBS plugin in PyMOL (v1.1.0 and v1.2.x, respectively) with a 0.15 M concentration for the +1 and −1 ion species (41). The atomic coordinates and structure factors are available from the Protein Data Bank (http://www.pdb.org/pdb/home/home.do) under the following accession numbers: 4JQV and 4JQX. The BZLF1 protein from EBV stimulates large and well-characterized CTL responses restricted through HLA-B*08:01 and HLA-B*35:01 (42-46). Strong BZLF1-specific T cell responses restricted through HLA-B*18:01 and HLA-B*44:03 have also been described, but the precise epitope sequences have not been mapped (44). To address this issue, overlapping 20-aa peptides corresponding to the BZLF1 protein sequence were screened for recognition by T cell lines raised by in vitro stimulation of PBMCs from healthy EBV-exposed individuals with their autologous LCLs. These IFN-γ ELISPOT assays showed that donors expressing either HLA-B*44:03 or HLA-B*18:01 recognized two or three peptides between residues 161 and 190 of BZLF1 (Supplemental Fig. 1). The peptide 168LEECDSELEIKRY180 from this region was later found to be recognized by both HLA-B*44:03+ and HLA-B*18:01+ EBV-specific T cells, and to more precisely map the target BZLF1 epitope within this 13-aa sequence, truncated versions of this peptide were screened for T cell recognition. All possible 8-, 9-, 10-, 11-, and 12-aa peptides from within this sequence were tested with T cells from five HLA-B*18:01+ and three HLA-B*44:03+ individuals, all of whom were EBV seropositive. Of interest, HLA-B*18:01+ individuals recognized all peptides that included the 173SELEIKRY180 octamer sequence, whereas HLA-B*44:03+ individuals recognized the dodecamer peptide 169EECDSELEIKRY180 strongly, but not shorter peptides (Fig. 1A). Note that both sequences have Glu at position 2 and the shared Tyr180 residue at the C terminus, which are the preferred primary anchor residues for both HLA-B*18:01 and HLA-B*44:03 (6, 7). Overlapping length-variant epitopes mapped from the BZLF1 Ag of EBV for the HLA-B*44 supertype-restricted T cell response. (A) EBV-specific T cell lines from five HLA-B*18:01+ and three HLA-B*44:03+ individuals, raised by in vitro stimulation with irradiated autologous LCLs, tested in IFN-γ ELISPOT assays for recognition of overlapping peptides corresponding to a region of the BZLF1 protein sequence. EBV-specific T cell lines from (B) an HLA-B*18:01+ and (C) an HLA-B*44:03+ individual, tested in chromium-release assays for recognition of HLA-B*18:01+ and HLA-B*44:03+ target cells, respectively, treated with various concentrations of the indicated peptides. EBV-specific T cell lines from (D) two HLA-B*18:01+ and (E) two HLA-B*44:03+ individuals, analyzed by flow cytometry with tetramers of the HLA-B*18:01–SELEIKRY and HLA-B*44:03–EECDSELEIKRY complexes, respectively. These experiments were conducted at least twice with similar results. One possible explanation for these patterns of T cell recognition is that HLA-B*18:01 presents SELEIKRY, whereas HLA-B*44:03 presents the unusually large EECDSELEIKRY peptide from the BZLF1 protein. To investigate this issue, we tested a T cell line from an HLA-B*18:01+ individual (HLA-A2, B*18:01, B62), using chromium-release assays for recognition of HLA-B*18:01+ target cells that had been treated with various concentrations of these two peptides. T cells from an HLA-B*44:03+ individual (HLA-A1, A29, B8, B*44:03) were also tested, using HLA-B*44:03+ target cells. The 11-aa peptide ECDSELEIKRY was included to verify that T cell recognition in the context of HLA-B*44:03 requires the full 12-aa sequence. These experiments confirmed that the octamer was the minimal peptide with maximal activity and therefore the likely target epitope presented by HLA-B*18:01 (Fig. 1B). In contrast, HLA-B*44:03+ T cells lysed only target cells presenting the HLA-B*44:03–EECDSELEIKRY complex (Fig. 1C). Furthermore, flow cytometric analysis with tetramers of the HLA-B*18:01–SELEIKRY or HLA-B*44:03–EECDSELEIKRY complexes confirmed recognition of the different-length peptides by EBV-specific T cells restricted by each of these HLA-B*44 supertype alleles (Fig. 1D, 1E). The specificity of these tetramers for each pMHC complex was confirmed by including T cell lines from HLA-B*18:01− and HLA-B*44:03− individuals that showed no staining (data not shown). To study mechanisms controlling the epitope selection differences of HLA-B*18:01 and HLA-B*44:03, we assessed the stability of the HLA–peptide complexes by measuring their thermal stability. HLA-B*18:01 was successfully refolded and purified in complex with both SELEIKRY and EECDSELEIKRY. The thermal unfolding properties of the two HLA-B*18:01 complexes were analyzed by circular dichroism spectroscopy (Fig. 2). Data for each complex were acquired at two different protein concentrations, resulting in an average Tm of 60.9°C ± 0.1°C for HLA-B*18:01–SELEIKRY and 52.2°C ± 1.9°C for HLA-B*18:01–EECDSELEIKRY. The resulting Tm difference of 8.7°C ± 2.8°C is consistent with the observed preference of this HLA allele for the shorter of the two peptide variants. Notably, attempts at refolding the HLA-B*44:03–SELEIKRY complex were unsuccessful, and so it was not possible to compare the binding stability of the length-variant peptides to this HLA molecule. However, this observation strongly indicates weak binding, which is consistent with the preference of HLA-B*44:03 for the 12-aa BZLF1 peptide. Thermal stability of the HLA-B*18:01–octamer and HLA-B*18:01–dodecamer complexes. Thermal unfolding of HLA-B*18:01 complexes as measured by circular dichroism spectroscopy at 218.5 nm. Representative curves for the 8-aa SELEIKRY peptide and the EECDSELEIKRY 12-aa peptide complexes are shown. To indirectly assess presentation of the 8-aa and 12-aa epitopes, and determine which residues are important for T cell recognition, peptides into which Ala substitutions were introduced were tested for their capacity to activate T cells from HLA-B*18:01+ or HLA-B*4403+ individuals. Ala substitution at position 2 or the C terminus (pE2 and pY-Ω) reduced T cell activation by both peptides, and this is consistent with the likely role of these residues as primary anchor residues (Fig. 3). Other amino acid substitutions that negatively affected T cell recognition were at positions 3, 4, 5, 6, and 7 within the SELEIKRY peptide, and positions 6, 7, 8, and 11 within EECDSELEIKRY. These are therefore possible exposed residues contacted by the Ag receptors of the T cells used in these assays, or residues important in stabilizing the immunogenic conformation of the pHLA complex. Collectively, these data, together with the aforementioned data, provide proof-of-concept that polymorphism within an HLA class I supertype can diversify T cell epitope selection by influencing the preferred length of the presented peptide from within an Ag. Impact on T cell recognition of Ala substitutions within the length-variant peptide epitopes. EBV-specific T cell lines from (A) an HLA-B*18:01+ and (B) an HLA-B*44:03+ individual, tested in IFN-γ ELISPOT assays for recognition of HLA-B*18:01+ and HLA-B*44:03+ target cells, respectively, treated with 1 μM of the peptides listed on the vertical axis. The Ala replacement residues are shown in bold underlined text. These experiments were conducted at least twice with similar results. To investigate the molecular basis for the preferential binding of the 8-aa and 12-aa peptides to HLA-B*18:01 and HLA-B*44:03, respectively, the structures of each pHLA binary complex were determined to high resolution (see Supplemental Tables I and II for data collection and refinement statistics). For the HLA-B*18:01–octamer complex, all residues corresponding to the SELEIKRY peptide were well ordered and clearly visible (Fig. 4A, 4B). The structure of the HLA-B*44:03–dodecamer complex revealed clear, unbiased density for the N and C termini of the peptide (pE1-pD4 and pI9-pY12; Fig. 4C), whereas the bulged region was less well resolved, consistent with a greater degree of mobility of this 12-aa peptide (Fig. 4D). The crystal structures of HLA-B*18:01–SELEIKRY and HLA-B*44:03–EECDSELEIKRY. (A) Refined coordinates for the binary complex between HLA-B*18:01 (green sections) and the 8-aa peptide SELEIKRY (yellow sticks) overlaid with the unbiased Fo-Fc density for the peptide contoured at 2.5 σ (magenta mesh). (B) Refined coordinates for the HLA-B*18:01–8-aa complex overlaid with the final 2Fo-Fc density for the peptide contoured at 1 σ (blue mesh). In both images the α2-helix has been removed for clarity. (C and D) Equivalent images for the binary complex between HLA-B*44:03 (blue sections) and the 12-aa peptide EECDSELEIKRY (lime green sticks). In complex with HLA-B*18:01, the SELEIKRY peptide adopted an extended conformation in which the peptide was characterized by minimal intramolecular contacts, consistent with an unconstrained conformation (47). The side chains of pE2, pI5, and pY8 pointed down toward the floor of the cleft, whereas pL3 was directed toward the α2-helix. The side chains of pS1, pE4, pK6, and pR7 pointed out of the cleft, with pE4, pK6, and pR7 highly solvent accessible and thus likely to play a role in directly contacting the TCR, consistent with the observed impact on T cell recognition of their substitution by an Ala (Fig. 3A). The SELEIKRY peptide was anchored to the cleft of HLA-B*18:01 primarily by pE2 and pY8 (Fig. 5A, 5B; Table I). Namely, the side chain of pE2 formed hydrogen bonds to S24 and Y99, and a potential salt bridge to H9, as well as forming a network of water-mediated and van der Waals contacts with HLA-B*18:01. In addition to sharing extensive Van der Waals contacts with the MHC, the side chain of pY8 formed hydrogen bonds with R97 and S116 (Fig. 5B). Differences in primary and secondary peptide anchoring between HLA-B*18:01–SELEIKRY and HLA-B*44:03–EECDSELEIKRY. Refined coordinates of the HLA-B*18:01–octamer (A, B, and F) and HLA-B*44:03–dodecamer (C–E) structures. In each case, the H chain is rendered schematically (green and blue, respectively), with selected side chains shown as sticks. The 8-aa and 12-aa peptides are presented as sticks (yellow and lime green, respectively). Selected water molecules are represented by red spheres. Hydrogen bonding and potential salt bridge interactions are shown as dashes. (A and C) Interactions between the primary peptide anchor pGlu-2 and either HLA-B*18:01 or HLA-B*44:03, respectively. All H chain residues involved in interactions with pGlu-2 (whether van der Waals, hydrogen bonding, or ionic) are shown in stick format. (B and E) Interactions between the primary pΩ anchor (Tyr8 or Tyr12) and either HLA-B*18:01 or HLA-B*44:03, respectively. (D and F) In the HLA-B*44:03–dodecamer complex, the side chain of pLys-10 is buried deep within the cleft. In the HLA-B*18:01–octamer structure, the equivalent peptide residue (pLys-6) adopts a solvent-accessible conformation. In complex with HLA-B*44:03, the EECDSELEIKRY peptide adopted a bulged conformation, with pR11 and the residues of the central bulged region (pD4–pI9) highly solvent exposed and therefore representing potential TCR contact points (Fig. 4C). This finding was consistent with the Ala substitution functional data (Fig. 3B), showing that pR11 and residues at the apex of the peptide bulge were critical for T cell recognition. Few interactions were observed between residues in the central region of EECDSELEIKRY and the HLA (Table I), which is consistent with the observed disorder in this region. 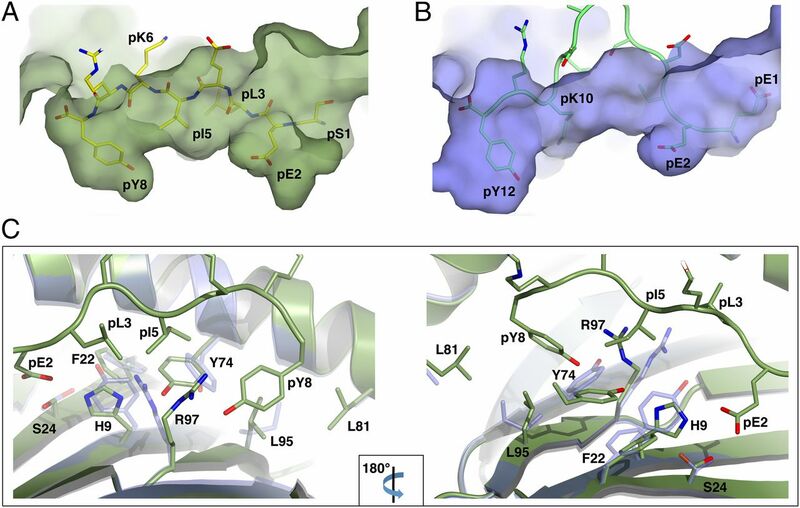 Anchoring of EECDSELEIKRY to the cleft of HLA-B*44:03 was mediated predominantly by residues pE1, pE2, pK10, and pY12 (Table I), all of which were involved in multiple direct polar and ionic interactions with the MHC, in addition to forming a number of van der Waals and water-mediated contacts. Namely, the side chain of pE1 formed a salt bridge to R62 and R170 (not shown), whereas the side chain of pE2 interacted with Y9, K45, and Y99 (Fig. 5C) and formed water-mediated interactions with T24, S67, and N70. The side chain of pK10 salt bridged with D114 and D116 (Fig. 5D), whereas the side chain of pY12 hydrogen bonded to D116 (Fig. 5E). The polymorphic differences between the HLA-B*18:01 and HLA-B*44:03 alleles markedly alter the shape and electrostatic properties of their Ag-binding clefts (Fig. 6A–C) and remodel the primary peptide anchor pockets (Fig. 5). Consequently, interactions between these two alleles and positions pE-2 and pY-Ω of the 8- and 12-aa peptides differed. The pE-2 of each peptide interacted directly with up to five polymorphic positions (positions 9, 24, 45, 63, and 163), four of which are nonconservative substitutions (H9Y, T45K, N63E, and T163L) (Fig. 6C). Of note, these substitutions did not alter the number of hydrogen bonding contacts between each allele and pE2, and a salt bridge interaction was also maintained in both (Table I). However, for these interactions to be maintained and steric clashes to be avoided, pE-2 was “pushed” toward the α2-helix in HLA-B*44:03. The observed shift was large (≤1.5-Å movement in the side chain) and had an impact on the backbone conformation of adjacent peptide positions (Fig. 7). Polymorphism alters the electrostatic properties of the Ag-binding cleft in HLA-B*18:01 and HLA-B*44:03. 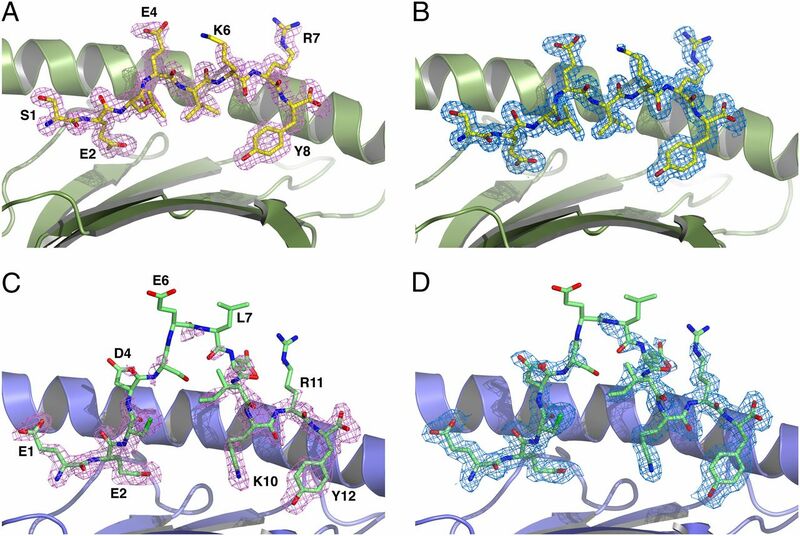 Surface representation of the Ag-binding clefts of HLA-B*18:01 (A) and HLA-B*44:03 (B) as observed in the 8-aa and 12-aa complex structures, respectively. In each case the ± 5 kT/e electrostatic potential from the solvent-accessible surface of the MHC has been rendered on the molecular surface. The 8-aa and 12-aa peptides are shown in stick format and are colored yellow and lime, respectively. (C) Superposition of HLA-B*18:01 (green) and HLA-B*44:03 (blue), showing the Ag-binding cleft from above. The heavy chains and β2-microglobulin (gray) are rendered schematically, with polymorphic residues shown as sticks. Selected polymorphic residues are labeled according to the HLA-B*18:01 sequence. Superposition of the crystal structures of HLA-B*18:01–SELEIKRY and HLA-B*44:03–EECDSELEIKRY. Superposition of the refined coordinates of the HLA-B*18:01–octamer and HLA-B*44:03–dodecamer complexes, using main chain atoms from residues 1–181 of the H chain (root mean square deviation = 0.30 Å), viewed either from above or through the α2-helix (left and right panels, respectively). The heavy chains of HLA-B*18:01 (green) and HLA-B*44:03 (blue) are rendered schematically. Peptide atoms are shown as sticks, using the same color scheme. In this superposition, main chain atoms of the peptide anchors Glu-2 and Tyr-Ω show displacements >1 Å and higher than for any H chain residue in the range to 1 from 181. HLA polymorphism had a similar effect at pΩ, where the Tyr interacted directly with five residues that are different between HLA-B*18:01 and HLA-B*44:03 (positions 77, 80, 81, 95, and 116), although only one of these is a nonconservative substitution (S116D) (Fig. 6C). Nevertheless, these substitutions resulted in a significant shift in the position of pY-Ω (≤2.8 Å in the side chain), which in turn altered the backbone conformation of the C-terminal region of the two peptides (Fig. 7). Compared with the HLA-B*18:01–octamer complex, pY-Ω was raised out of the cleft in B*44:03 and lost two direct hydrogen bond contacts with the H chain. The HLA polymorphisms between HLA-B*18:01 and HLA-B*44:03 did not affect the primary anchor positions alone. In the B*44:03 complex, for example, pK10 served as a secondary anchor, with its side chain buried deep within the cleft, where it interacted with D114 and the polymorphic residue D116, as well as forming a number of van der Waals contacts with several other MHC residues (Fig. 5D). In the HLA-B*18:01–octamer complex, the equivalent peptide residue of SELEIKRY (pK6) adopted a very different conformation, with its side chain facing out of the cleft (Fig. 5F). In the HLA-B*18:01 complex, the pocket that would otherwise be occupied by the pK6 was occupied by R97 and pY-Ω. pY-Ω sat in the observed position because of the polymorphic substitutions A81L and I95L, whereas the Y9H substitution may have made the observed R97 conformation more energetically favorable. Binding of the SELEIKRY peptide to HLA-B*44:03 is predicted to be less favorable owing to steric clashes between pL3, pI5, and R97. Because of its shorter length and anchoring requirements, the SELEIKRY peptide is likely to be forced to sit flat along the center of the cleft of HLA-B*44:03. However, the depth of the central region of the HLA-B*18:01 cleft observed in the structure was deeper than that of HLA-B*44:03, as illustrated in Fig. 8 (Fig. 8A, 8B, respectively). This difference is the result of R97 adopting a conformation in HLA-B*18:01, in which it was folded toward the C-terminal end of the cleft. This conformation of R97 was dependent on Y74, which was in turn influenced by the polymorphic positions H9 and S24 (Fig. 8C). In the HLA-B*18:01 structure, these residues allowed the side chain of Y74 to rest in a forward position, where it hydrogen bonded to R97. The H9Y substitution in HLA-B*44:03, as well as the S24T substitution, forced the aromatic ring of Y74 to swing toward the back of the cleft. In this position, Y74 would have clashed with the folded conformation of R97, which instead was observed in an upright conformation, thereby reducing the depth of the cleft. Collectively, the structural data show that the binding of shorter peptides by HLA-B*44:03 is more likely to be disfavored owing to steric clashes, as such peptides need to sit flatter within the cleft. Polymorphic differences between HLA-B*18:01 and HLA-B*44:03 alter the shape of their Ag-binding clefts. (A and B) Surface representation of the Ag-binding clefts of HLA-B*18:01 (A) and HLA-B*44:03 (B) viewed through the α1-helix. The peptide pockets are rendered in semitransparent mode, with the 8-aa and 12-aa peptides shown in stick format. Polymorphic differences between these two alleles lead to remodeling of their B and F pockets, the latter of which can accommodate a Trp residue in the case of HLA-B*44:03 alone. Moreover, the central region of the HLA-B*44:03 cleft is rendered shallower than that of HLA-B*18:01 (the region corresponding to association of the 8-aa peptide positions pL3–pK6). (C) Detail of the Ag-binding cleft in the HLA-B*18:01–8-aa complex viewed through the α2- and α1-helices (left and right panels, respectively). The H chain and peptide are presented schematically (colored green), with key side chains shown as sticks. Superimposed is the structure of the HLA-B*44:03–12-aa complex (colored blue), drawn in semitransparent mode. Only H chain residues of HLA-B*44:03 are shown. Polymorphism at key positions within the cleft has an impact on the conformation of surrounding H chain residues, including the conserved Arg97. In HLA-B*18:01, the side chain of Arg97 is able to adopt a folded conformation that points toward the C terminus of the cleft, whereas in the HLA-B*44:03 complex, Arg97 is forced into an upright position. The folded conformation of Arg97 deepens the central region of the HLA-B*18:01 cleft sufficiently to accommodate the side chains of the pL3 and pI5 residues of the 8-aa epitope. To investigate the possibility that epitope selection in the T cell response to BZLF1 is influenced by inherent variability in the peptide length specificity of different HLA molecules, the global self-peptide repertoires of HLA-B*18:01 and HLA-B*44:03 were compared. We employed MHC peptide elution following immunoprecipitation of class I complexes from C1R cells engineered to express either of the two alleles (C1R-B*18:01 and C1R-B*44:03) (14, 15, 30). Peptides were detected by LC–tandem mass spectrometry, and endogenous human sequences analyzed by the ProteinPilot algorithm. We first analyzed the binding motif of the two alleles. Although both motifs have been described previously (5–7), we confirm in this study the nearly exclusive preference for a p2 Glu, and dominant Tyr or Phe at the C terminus, with an additional codominance of Trp in HLA-B*44:03 (but not B*18:01) (Fig. 9A, 9B). The preference for Trp in HLA-B*44:03 alone can be accounted for fully by the observed structural influence of polymorphic substitutions on the F pockets of these two alleles. More importantly, analysis of > 1200 individual sequences across the two alleles revealed a striking difference in peptide length distribution (Fig. 9C, 9D). Of the total peptides 8–12 aa in length, 8-aa (17%) and 9-aa (76%) peptides dominated the B*18:01 repertoire, with 10-aa (4.5%), 11-aa (1.7%), and 12-aa (0.6%) peptides making a small contribution. In contrast, peptides eluted from HLA-B*44:03+ cells were dominated by the longer lengths (9 aa, 48%; 10 aa, 33%; 11 aa, 14%; and 12 aa, 4.5%), with 8-aa peptides present at a frequency of just 0.8%. These data thus provide a basis for understanding functional and biochemical findings with the BZLF1 epitopes SELEIKRY and EECDSELEIKRY, in that these alleles are intrinsically biased toward differing peptide lengths. 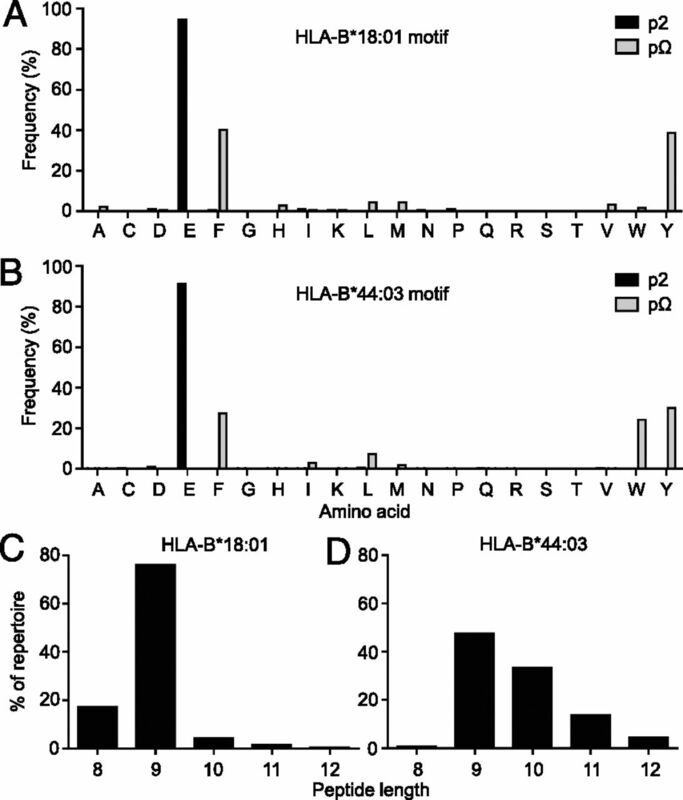 Binding specificity of HLA-B*18:01 and HLA-B*44:03 assessed by analysis of endogenous human peptide ligands. The global self-peptide repertoires of HLA-B*18:01 and HLA-B*44:03 were compared by eluting peptides from the C1R-B*18:01 and C1R-B*44:03 cell lines, followed by LC–tandem mass spectrometry. (A) The frequency of amino acids occurring at P2 and PΩ in peptides eluted from HLA-B*18:01 and (B) HLA-B*44:03 is shown. (C) The distribution of peptide lengths from the datasets for HLA-B*18:01 and (D) HLA-B*44:03 is also shown. Polymorphism at the MHC locus enhances immune defense across the population by ensuring wide variation in the T cell response to infecting pathogens, and this is primarily achieved through presentation of a diverse array of antigenic peptide sequences. The present study points out that class I MHC polymorphism influences not only amino acid preferences at different positions within peptide ligands but also the length of presented peptides. Furthermore, this report, to our knowledge, is the first to show that variability in the peptide length preferences of different MHC molecules can influence epitope selection in an Ag-specific T cell response, thus highlighting a novel mechanism through which MHC class I polymorphism can further diversify immune responses. The CD8+ T cell response to the BZLF1 Ag of EBV was specific for either the SELEIKRY octamer or the EECDSELEIKRY dodecamer peptide, depending on whether it was restricted by HLA-B*18:01 or HLA-B*44:03, respectively. The likely mechanism for this intriguing observation was revealed by pMHC binding assays showing that the octamer peptide bound more stably to HLA-B*18:01 than did the dodecamer peptide, whereas HLA-B*44:03 bound only the longer peptide. Subsequent structural studies of these viral pMHC complexes indicated that the binding clefts of these two members of the HLA-B*44 supertype may favor the presentation of peptides of different lengths, with the more “shallow” groove of HLA-B*44:03 leading to steric clashes with octamer peptides. Indeed, the intrinsic bias of these two HLA alleles for peptides of different length was confirmed by mass spectrometric identification of natural ligands for HLA-B*18:01 and HLA-B*44:03, showing that 18% of peptides presented by HLA-B*18:01 were octamers versus 0.8% for HLA-B*44:03, whereas peptides of > 10 aa were more frequently presented by HLA-B*44:03 (18.5%) than by HLA-B*18:01 (2.3%). It should be noted that peptide secondary anchor residues could also play a role in influencing the relative binding stability of the two EBV length-variant peptides to HLA-B*18:01 or HLA-B*44:03, although no direct evidence was found for this in our global analysis of the self-peptide repertoires of these two HLA-B*44 supertype allomorphs. For example, there was no preference for Ser at P1 within self-peptides eluted from HLA-B*18:01, nor for Glu at P1 within self-peptides eluted from HLA-B*44:03 (data not shown). Nonetheless, pE1 of the 12-aa peptide and pS1 of the 8-aa peptide do interact differently with HLA-B*44:03/B*18:01, with a more extensive network of van der Waals and hydrogen bonds observed with pE1 of the 12-aa peptide than with pS1 of the 8-aa peptide. Major differences were also observed with the Lys residue of each peptide. The pK6 of SELEIKRY points out of the HLA cleft, whereas the pK10 of EECDSELEIKRY plays an important secondary anchor residue role. In all structures of HLA-B*44:03 determined to date, in complex with different peptide ligands, Arg97 has been shown to adopt the same “upright” conformation seen in the HLA-B*44:03–12-aa complex presented in this article (8, 29, 35, 48). This residue plays a major role in reducing the size of the peptide-binding cleft and is shared by HLA-B*44:02, which differs from HLA-B*44:03 by only a single Asp156Leu substitution, and which also displays the same aversion for presenting 8-aa peptides (6). In fact, comparison of all published structures of HLA-B*44:02 and HLA-B*44:03 in complex with a variety of peptides reveals that their Ag-binding grooves share a highly conserved conformation. This observation would suggest that the clefts of these two alleles lack plasticity, and this may be another factor influencing their reduced tolerance for binding shorter peptides. Other HLA class I allomorphs have shown a preference for peptides of a certain length. For example, different members of the HLA-B*41 allelic group show marked differences in peptide length preferences (24). Although the HLA-B*41:03 and HLA-B*41:04 alleles were able to present peptides of 9 aa in length or longer (up to 16 aa in the case of HLA-B*41:03 and 15 aa in the case of HLA-B*41:04), octamers were eluted only from HLA-B*41:04 and accounted for > 20% of peptides. Of interest, HLA-B*41:04 is characterized by an Arg97Ser substitution in comparison with HLA-B*41:03, which increases the size of the HLA-B*41:04 Ag-binding cleft by 140 Å3. In addition, HLA-A*02:01 has been shown to disfavor the presentation of octamer peptides (14). Like HLA-B*41:03 and HLA-B*44:02/03, HLA-A*02:01 has an Arg residue at position 97. When compared with HLA-A*02:01, the Ag-binding cleft of HLA-B*08:01, an allele with an apparent propensity for binding 8-aa peptides (49, 50), is considerably deeper owing to a number of polymorphic substitutions, including Phe9Asp, His74Asp, Arg97Ser, and His114Asn. Clearly, the prediction of which HLA alleles favor presentation of octamer peptides cannot simply be reduced to the identity of a particular polymorphic residue, such as position 97. The alleles HLA-B*57:01 and HLA-B*57:03 have a relatively small residue (Val) at position 97, yet both have been shown to disfavor the presentation of octamer peptides (15). Instead, these two alleles are characterized by different bulky substitutions within the Ag-binding cleft when compared with HLA-B*18:01. These include His9Tyr and Ser67Met, which are common to both HLA-B*57:01 and HLA-B*57:03, and Ser116Tyr, which is specific to HLA-B*57:03. Furthermore, volumetric measure of the Ag-binding cleft may not always reflect the peptide length preferences of HLA alleles. In the case of HLA-B*18:01 and HLA-B*44:03, the overall volume of their respective clefts differs by only 50Å3, although polymorphic differences between the two do render the central region of the HLA-B*44:03 cleft shallower than that of HLA-B*18:01. The importance of relative depth and contour features of the Ag-binding cleft in peptide length preferences has also been highlighted for different murine class I alleles. In particular, the ability of H2-Kb, but not H2-Db, to bind peptides shorter than 9 residues has been attributed to a hydrophobic ridge present within the Ag-binding cleft of the latter, but not the former, allele (51, 52). By contrast, a structurally distinct hydrophobic ridge present in the cleft of H2-Ld (53, 54) does not impose the same minimum length requirements on bound peptides, presumably owing to its ability to be more readily remodeled in response to binding of octamer peptides. Importantly, the distinct structural features between these alleles have also been shown to have an impact on alloreactivity (55). Structural features of the MHC class I peptide-binding cleft also appear to limit the capacity to present peptide ligands of > 10 amino acids in length. Unusually long peptide ligands have not been described for allotypes such as H2-Kb, HLA-B*08:01, and HLA-B*14, presumably because these molecules generally require a primary anchor residue in the central part of the peptide, as well as primary or secondary anchors at the extremities, which is unlikely to be compatible with the looping conformation of long peptides. Thus, through various mechanisms, MHC class I polymorphism promotes the presentation of epitopes of variable size, thereby contributing to the diversity of Ag-specific immune responses across the population and ensuring effective immune surveillance by CD8+ T cells. Evolutionary pressure on MHC class I molecules to maintain polymorphisms that enhance the presentation of a diverse array of peptide sizes could be provided by pathogens, such as human CMV, that interfere with trimming of pathogen-derived peptides, leading to reduced susceptibility of infected cells to T cell recognition (56, 57). We thank the staff at the Advanced Photon Source (Chicago, IL) and the Australian Synchrotron (Melbourne, Australia) for assistance with data collection. This work was supported by the National Health and Medical Research Council (NHMRC) of Australia and the Australian Research Council (ARC). J.J.M. is supported by an NHMRC Career Development Fellowship, S.R.B. by an NHMRC Principal Research Fellowship, A.W.P. by an NHMRC Senior Research Fellowship, S.G. by an ARC Future Fellowship, and J.R. by an NHMRC Australia Fellowship. The atomic coordinates and structure factors presented in this article have been submitted to the Protein Data Bank (http://www.pdb.org/pdb/home/home.do) under accession numbers 4JQV and 4JQX.
. 2006. Specificity on a knife-edge: the alphabeta T cell receptor. Curr. Opin. Struct. Biol. 16: 787–795.
. 1993. 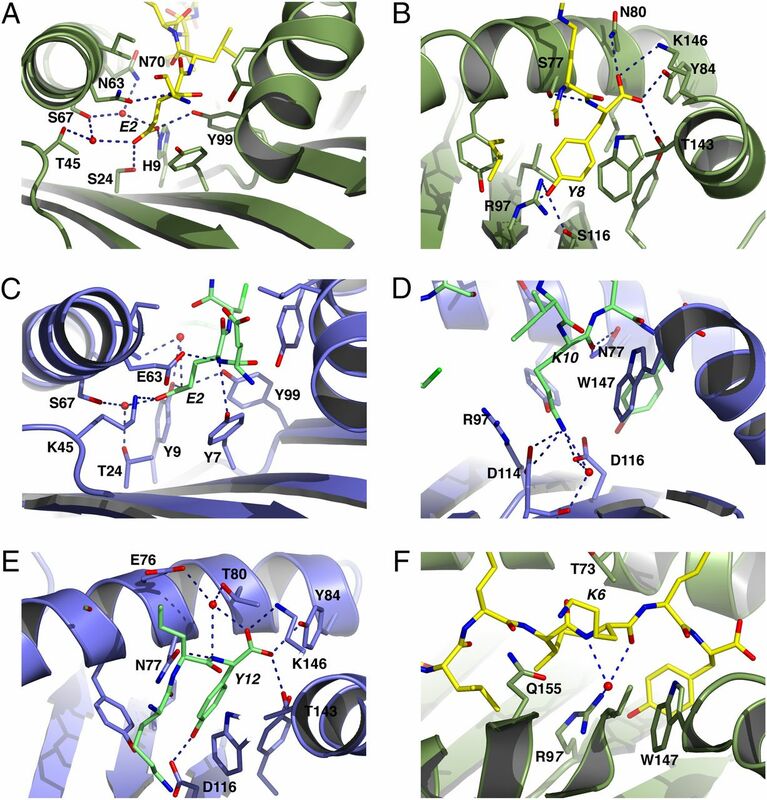 Prominent role of secondary anchor residues in peptide binding to HLA-A2.1 molecules. Cell 74: 929–937.
. 2007. The impact of HLA-B micropolymorphism outside primary peptide anchor pockets on the CTL response to CMV. Eur. J. Immunol. 37: 946–953.
. 1999. Nine major HLA class I supertypes account for the vast preponderance of HLA-A and -B polymorphism. Immunogenetics 50: 201–212.
. 2003. 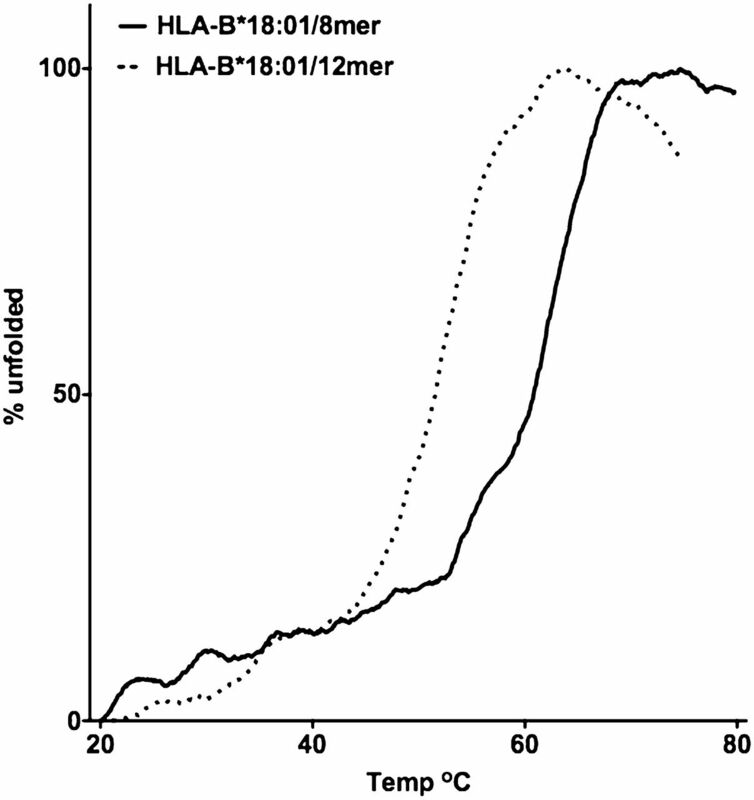 Simultaneous prediction of binding capacity for multiple molecules of the HLA B44 supertype. J. Immunol. 171: 5964–5974.
. 2008. Essential differences in ligand presentation and T cell epitope recognition among HLA molecules of the HLA-B44 supertype. Eur. J. Immunol. 38: 2993–3003.
. 2004. Toward a definition of self: proteomic evaluation of the class I peptide repertoire. J. Immunol. 172: 2944–2952.
. 2003. A naturally selected dimorphism within the HLA-B44 supertype alters class I structure, peptide repertoire, and T cell recognition. J. Exp. Med. 198: 679–691.
. 1994. Importance of peptide amino and carboxyl termini to the stability of MHC class I molecules. Science 265: 398–402.
. 2001. An alternative open reading frame of the human macrophage colony-stimulating factor gene is independently translated and codes for an antigenic peptide of 14 amino acids recognized by tumor-infiltrating CD8 T lymphocytes. J. Exp. Med. 193: 1189–1198.
. 2006. A long N-terminal-extended nested set of abundant and antigenic major histocompatibility complex class I natural ligands from HIV envelope protein. J. Biol. Chem. 281: 6358–6365.
. 2008. Preferential binding of unusually long peptides to MHC class I and its influence on the selection of target peptides for T cell recognition. Mol. Immunol. 45: 1818–1824.
. 2006. Have we cut ourselves too short in mapping CTL epitopes? Trends Immunol. 27: 11–16.
. 2012. Secreted HLA recapitulates the immunopeptidome and allows in-depth coverage of HLA A*02:01 ligands. Mol. Immunol. 51: 136–142.
. 2012. Immune self-reactivity triggered by drug-modified HLA-peptide repertoire. Nature 486: 554–558.
. 2001. Two different, highly exposed, bulged structures for an unusually long peptide bound to rat MHC class I RT1-Aa. Immunity 14: 81–92.
. 1992. Different length peptides bind to HLA-Aw68 similarly at their ends but bulge out in the middle. Nature 360: 364–366.
. 2004. Conformational restraints and flexibility of 14-meric peptides in complex with HLA-B*3501. J. Immunol. 173: 5610–5616.
. 2005. High resolution structures of highly bulged viral epitopes bound to major histocompatibility complex class I. Implications for T-cell receptor engagement and T-cell immunodominance. J. Biol. Chem. 280: 23900–23909.
. 2005. CTL recognition of a bulged viral peptide involves biased TCR selection. J. Immunol. 175: 3826–3834.
. 2006. TCR alpha genes direct MHC restriction in the potent human T cell response to a class I-bound viral epitope. J. Immunol. 177: 6804–6814.
. 2005. 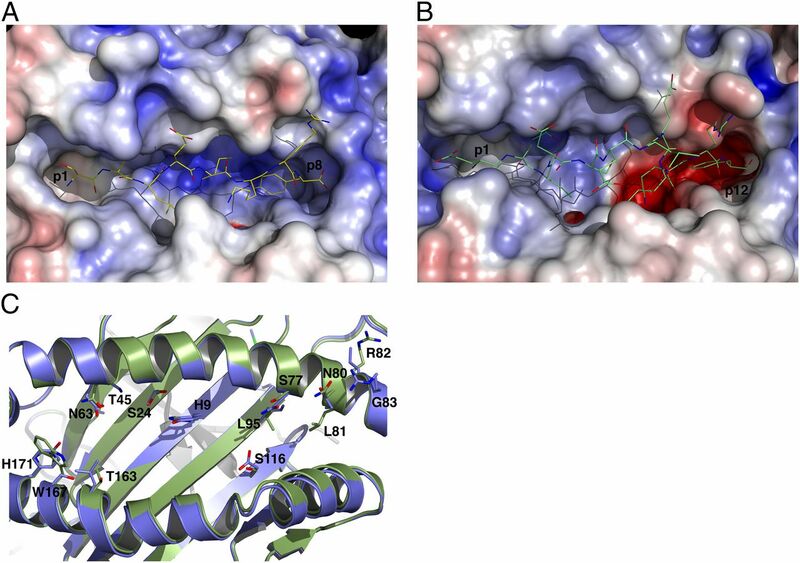 Structures of three HIV-1 HLA-B*5703-peptide complexes and identification of related HLAs potentially associated with long-term nonprogression. J. Immunol. 175: 2459–2468.
. 2008. Impact of clonal competition for peptide-MHC complexes on the CD8+ T-cell repertoire selection in a persistent viral infection. Blood 111: 4283–4292.
. 2011. The impact of human leukocyte antigen (HLA) micropolymorphism on ligand specificity within the HLA-B*41 allotypic family. Haematologica 96: 110–118.
. 2009. A long, naturally presented immunodominant epitope from NY-ESO-1 tumor antigen: implications for cancer vaccine design. Cancer Res. 69: 1046–1054.
. 2005. T cell receptor recognition of a ‘super-bulged’ major histocompatibility complex class I-bound peptide. Nat. Immunol. 6: 1114–1122.
. 2013. Peptide length determines the outcome of TCR/peptide-MHCI engagement. Blood 121: 1112–1123.
. 2012. Constitutive and inflammatory immunopeptidome of pancreatic β-cells. Diabetes 61: 3018–3025.
. 2007. Processing Diffraction data with mosflm. In Evolving Methods for Macromolecular Crystallography. Read and Sussman, eds. Springer, Dordrecht, the Netherlands, p. 41–51. 2011. An introduction to data reduction: space-group determination, scaling and intensity statistics. Acta Crystallogr. D Biol. Crystallogr. 67: 282–292.
. 2005. Likelihood-enhanced fast translation functions. Acta Crystallogr. D Biol. Crystallogr. 61: 458–464.
. 2004. Natural HLA class I polymorphism controls the pathway of antigen presentation and susceptibility to viral evasion. J. Exp. Med. 200: 13–24.
. 2010. MolProbity: all-atom structure validation for macromolecular crystallography. Acta Crystallogr. D Biol. Crystallogr. 66: 12–21.
. 2006. CASTp: computed atlas of surface topography of proteins with structural and topographical mapping of functionally annotated residues. Nucleic Acids Res. 34(Web Server issue): W116–118.
. 2004. PDB2PQR: an automated pipeline for the setup of Poisson-Boltzmann electrostatics calculations. Nucleic Acids Res. 32(Web Server issue): W665–667.
. 2001. Electrostatics of nanosystems: application to microtubules and the ribosome. Proc. Natl. Acad. Sci. USA 98: 10037–10041.
. 1999. A re-evaluation of the frequency of CD8+ T cells specific for EBV in healthy virus carriers. J. Immunol. 162: 1827–1835.
. 2004. Potent T cell response to a class I-binding 13-mer viral epitope and the influence of HLA micropolymorphism in controlling epitope length. Eur. J. Immunol. 34: 2510–2519.
. 2000. A global appraisal of immunodominant CD8 T cell responses to Epstein-Barr virus and cytomegalovirus by bulk screening. Eur. J. Immunol. 30: 2531–2539.
. 2007. A T cell receptor flattens a bulged antigenic peptide presented by a major histocompatibility complex class I molecule. Nat. Immunol. 8: 268–276.
. 1995. Specific cytotoxic T lymphocytes recognize the immediate-early transactivator Zta of Epstein-Barr virus. J. Virol. 69: 4872–4879.
. 2009. The peptide length specificity of some HLA class I alleles is very broad and includes peptides of up to 25 amino acids in length. Mol. Immunol. 46: 1911–1917.
. 1994. Endogenous peptides with distinct amino acid anchor residue motifs bind to HLA-A1 and HLA-B8. J. Immunol. 152: 620–631.
. 1992. Crystal structures of two viral peptides in complex with murine MHC class I H-2Kb. Science 257: 919–927.
. 1994. The three-dimensional structure of H-2Db at 2.4 A resolution: implications for antigen-determinant selection. Cell 76: 39–50.
. 1997. The three-dimensional structure of an H-2Ld-peptide complex explains the unique interaction of Ld with beta-2 microglobulin and peptide. Proc. Natl. Acad. Sci. USA 94: 6880–6885.
. 1989. A pentapeptide as minimal antigenic determinant for MHC class I-restricted T lymphocytes. Nature 337: 651–653.
. 1998. Structural basis of 2C TCR allorecognition of H-2Ld peptide complexes. Immunity 8: 553–562.
. 2011. Human cytomegalovirus microRNA miR-US4-1 inhibits CD8(+) T cell responses by targeting the aminopeptidase ERAP1. Nat. Immunol. 12: 984–991.
. 2010. Endoplasmic reticulum aminopeptidase associated with antigen processing defines the composition and structure of MHC class I peptide repertoire in normal and virus-infected cells. J. Immunol. 184: 3033–3042.